such offer or solicitation would be unlawful. 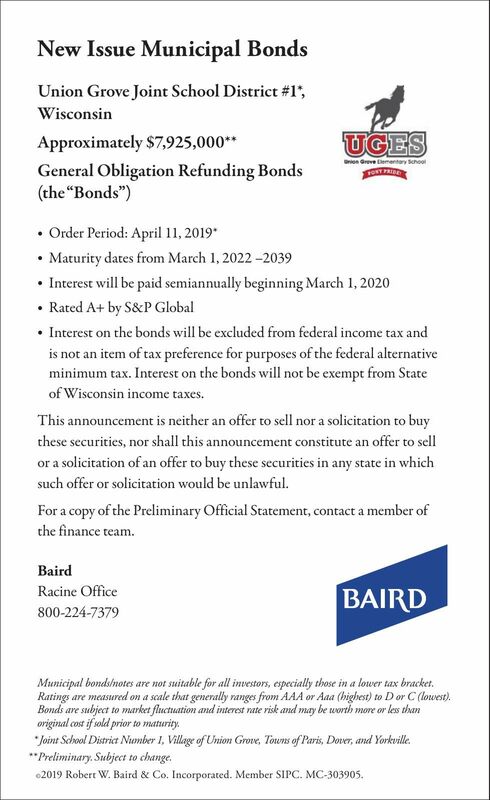 Municipal bonds/notes are not suitable for all investors, especially those in a lower tax bracket. Ratings are measured on a scale that generally ranges from AAA or Aaa (highest) to D or C (lowest). original cost if sold prior to maturity. * Joint School District Number 1, Village of Union Grove, Towns of Paris, Dover, and Yorkville. 2019 Robert W. Baird & Co. Incorporated. Member SIPC. MC-303905.